THIS IS IT. This is what has changed my life. “The best advice for a would-be entrepreneur, or really for anyone for that matter, you MUST find something you are passionate about. You can’t be successful at something you are not passionate about. You must love what you do, you must be deeply passionate about it, cause it’s gonna be hard, scary and difficult at times. And if you don’t love it deeply, there is no way you will endure and sustain what you are going to need to do to be successful at it. You have to get to the point where there is nothing you’d rather be doing then working, because the process of building your empire and championing your cause is so fun, so exhilarating to you, thus you are not really working at all. It is the product of your creativity and passion, followed by the bumps and bruises you will inevitably face along the way to finally reach your goal. I want that for you. It’s like unlocking your life force, when you find the courage to pursue what you can really get passionate about, it is when you feel what it’s like to live fully for the first time. It’s almost like you open up the channel to the power of the universe, everything starts to flow. You get filled up with zeal, zest and vitality. It’s intoxicating, exhilarating and marvelous. People, ideas and resources beat a path to your door, attracted by your magnificent and radiating passion. You become a force that can have a big impact on the people around you, maybe your community, maybe your country… and maybe well beyond that. So I challenge you to inquire within yourself. 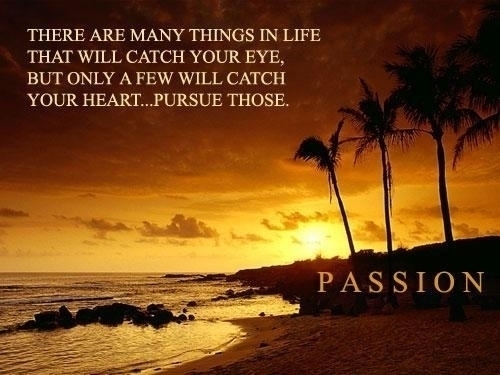 Are you deeply passionate about what you do? Could you become more passionate if you elevate the mission and purpose of your work. If not, then I further challenge you to figure out what you could become more passionate about doing. Try starting part-time, while you keep your job, or current business, then when your new venture is ready for prime-time, you can make the shift. That will be the last day you ever work again in your life. The day you start doing something you really love, is the day you stop working and start really living. The very idea of life and living will never be the same from that point forward. Not that it won’t be hard mind you, but it will be exhilarating, satisfying and deeply, soulfully rewarding. I have played this part of the CD over and over in my car, maybe 50 times and the part in bold is now marinated in my soul… especially this line: The day you start doing something you really love, is the day you stop working and start really living. I want this for you, for me, for everyone. I feel alive, join me. It’s never too late. We all have a gift. It’s figuring out what it is and then find a way to use it to help other people. Remember Mark Twain’s line: The two most important days in your life are the day you are born and the day you find out why. Good for you! It is so easy to just wander or sleep walk through life. Facing cancer, a life threatening disease and mortality puts a new perspective on how to spend our days. Until I started my own business I never woke up excited to go to work! My business evolved while I worked part time at another job for 4 years until I could devote and financially afford to make my company my primary employer. Thanks for the confirmation and for sharing your experience Haralee.